The MK 4 is Schoeps' best-selling capsule. It offers the highest sound quality, flat frequency response, optimal rejection of rear-incident sound, and a directional pattern that remains constant throughout the audio frequency range. The MK 4 is Schoeps' best-selling capsule. It offers the highest sound quality, flat frequency response, optimal rejection of rear-incident sound, and a directional pattern that remains constant throughout the audio frequency range. In the diffuse sound field it shows only a mild rise around 10 kHz; the sonic impression thus remains free of coloration even when sound is arriving from all sides at once. The sonic impression is thus free of coloration whether sound is arriving at the front or at the sides of the microphone, as well as for diffuse sound (reverberation) in a room. 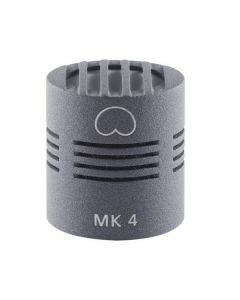 The MK 4 is often preferred by opera singers and other trained vocalists. But its natural, transparent character also suits it very well for use in pop and rock applications, on stage or in the studio, where equalization is a part of the plan. A microphone with a clear, neutral sound quality provides the ideal point of departure whenever special “coloring” is needed.